Draft: 2003, Cincinnati Reds, 16th rd. Christopher Charles Dickerson...Is a 2000 graduate of Notre Dame High School in Sherman Oaks, CA, where he had his number 24 retired in February of 2012...Hit .292 with 27 doubles, seven triples, 18 home runs and 107 RBI in his career at UNLV from 2000-03...Is the CEO and co-founder of "Players for the Planet," an organization that focuses on building awareness about environmental issues (www.playersfortheplanet.org), which was launched in 2008 with pitcher Jack Cassel...Has contributed to the World Child Project, an organization which provides for orphaned and abandoned children around the world. Split season between Baltimore and Triple-A Norfolk...Began season with Norfolk and went 3-for-15 (.200) with a triple and RBI in six games before having his contract selected on 4/10...Scored a run as a pinch runner while making his debut with the Orioles on 4/10 at Boston...Recorded three hits and two RBI on 4/30 at Seattle...His first homer with Baltimore was a three-run shot off Tampa Bay's Kyle Farnsworth on 5/17...Hit safely in seven straight games from 4/30 to 5/21, going 12-for-27 (.444) with two doubles, three home runs, eight RBI and five runs scored...Homered twice on 5/21 vs. New York (AL); his first career multi-home run contest...Connected off Detroit's Jose Valverde for first career walkoff home run on 5/31...Went 0-for-11 in seven games during the month of July before being designated for assignment on 7/19...Was outrighted to Norfolk on 7/28 and remained with the Tides before having contract selected again by Baltimore on 9/6...Went 0-for-3 with one run scored in 10 games with the Orioles in September. Hit .260 (13-for-50) with 9R, 2 doubles, 1HR and 7RBI in 60 games (six starts in RF, fourin LF) over four stints with the Yankees in 2011 (5/17-6/10, 6/12-7/4, 7/17-30 and 9/1-28) ... hit safely in five of his 10 starts. ... Made his Yankees debut in 5/17 win at Tampa Bay, starting in RF and going 1-for-3 with1RBI and 1SH ... was recalled from Triple-A Scranton/Wilkes-Barre prior to the game. ... Left 5/18 win at Baltimore after being hit in the helmetby a Mike Gonzalez pitch in the 15th inning ... was takento University of Maryland Hospital for a precautionaryCT scan (test results were normal) ... had entered thegame in the ninth inning in RF and went 1-for-2 with1HBP. ... Hit .357 (5-for-14) with 3R, 2 doubles and 3RBI in 15games over his first stint with the Yankees (5/17-6/10) ... was optioned to Scranton/WB on 6/10, but wasrecalled two days later when RHPs Bartolo Colon andAmauri Sanit were placed on the disabled list. ... In 16 games during his second stint (6/12-7/4), batted.167 (1-for-6), primarily appearing as a late-inningdefensive replacement. ... Was optioned to Scranton/WB on 7/4 when Derek Jeterwas reinstated from the 15-day D.L. ... Appeared in 10 games during his third Major Leaguestint from 7/17-30, going 3-for-8 (.375) while startingtwo games in LF ... was optioned to Scranton/WB for athird time following Game 1 of a doubleheader on 7/30to make room on the roster for that night's starter, RHPIvan Nova. ... Was recalled for a fourth time on 9/1 ... appeared in 19of the Yankees' final 30 games, going 4-for-22 (.182). ... Hit his first home run as a Yankee in 9/12 win at Seattle,going 2-for-4 with 1SB ... was his first home run since5/17/09 w/ Cincinnati at San Diego, snapping a 309ABhomerless stretch. ... In 57 games with Triple-A Scranton/Wilkes-Barre, batted .241 (51-for-212) with 33R, 10doubles, 2HR and 16RBI. ... Began spring training with the Milwaukee Brewers before being traded to the Yankeeson 3/25 in exchange for RHP Sergio Mitre ... in 18 combined spring training games,batted .333 (13-for-39) with 6R, 3 doubles, 1 triple and 6RBI ... in one game with theYankees, was 3-for-3 with 1 double and 1RBI. Batted a combined .206 with 0 HR and 5 RBI in 45 games between Cincinnati and Milwaukee...Made 23 starts (17g in CF, 3g in LF, 3g in RF)...Began the season on the Reds' Opening Day roster before landing on the 15-day disabled liston 4/30.....was transferred to the 60-day DL on 5/29...Underwent surgery on 5/3 to remove the broken hook of the hamate bone in his right hand,along with a procedure to clean out his right wrist...Appeared in 13 games at Triple-A Louisville from 7/16-8/3 while on rehab assignment...Was reinstated from the disabled list on 8/9 and traded to Milwaukee the same day inexchange for OF Jim Edmonds...Batted .205 (9-for-44) without an RBI in 20 games with the Reds...Made 10 starts with Cincinnati (6g in CF, 3g in LF, 1g in RF)...Batted .208 (11-for-53) with 5 RBI in 25 games with the Brewers...Made 13 starts with Milwaukee (11g in CF, 2g in RF)...Played in his first 3 games with the Brewers as #11.....switched to #7 on 8/13...His first Major League ejection came in Trevor Hoffman's 600th save game on 9/7 vs. St. Louisfor arguing balls and strikes with umpire Bob Davidson...Was nominated for the 2010 Branch Rickey Award for his humanitarian efforts. In his first full season ranked among the National League rookie leaders in hitting (.275, 6th), triples (3, 7th), stolen bases (11, 4th), on-base percentage (.370, 3rd), walks (39, 6th) and outfield assists (5, T3rd)...made just 1 appearance after 8/23, when at Pit he suffered a severely sprained left ankle...was on the disabled list twice, from 7/27-8/10 (bruised right rotator cuff) and from 8/25-9/29 (right ankle)...was reinstated from the DL for the last 5g of the season but played just once, as a defensive replacement in LF on 10/1 vsStL...in 11 games between stints on the DL hit .394...in his last 43 games prior to the ankle injury hit .318, raising BA from .234 to .277...made 59 starts (27 in LF, 19 in CF, 13 in RF)...in the batting order hit first (29 GS), second (19 GS), third (1 GS, 5/25 vs Hou), sixth (1gs, 7/19 vs Mil), seventh (5gs) and ninth (4gs)...while batting leadoff hit .298 with a .365 on-base percentage...in his last 23 apps of the first half hit .352, raising BA from .234 to .277...recorded 15 2-hit games and a pair of 3-hit games...from 4/28-5/1 missed 3 games with concussion-like symptons...on 7/12 at NYM, in the final game before the All-Star break, left with back spasms and then was scratched from the second-half opener...on 7/26 at Chi jammed his right shoulder while diving for Koyie Hill'seighth-inning triple and went on the DL the next day. Spent most of the season at ClassAAA Louisville but in his Major League debut made31 apps, including 25 starts, for the Reds...was theorganization's Minor League Player of the Month forJuly (.326, 8hr, 20rbi, 7sb)...on 8/12 was promotedto take the roster spot vacated by OF Adam Dunn,who was traded to the Diamondbacks...from 8/12-9/6 started 22 of the Reds' next 23g but then was slowedby a stress fracture in his posterior left ankle...made just 3 starts after 9/6 and made his last appearance ofthe season as a pinch hitter on 9/18 vs StL...a CT scan on 9/22 revealed the injury and on 9/26 had surgeryto remove a piece of bone related to the stress fracture (Dr. Timothy Kremchek)...in August led the Reds indoubles (7) and stolen bases (5)...the Reds went 13-12 in his 25 starts, all batting leadoff...produced a pair ofleadoff HR...made 19 starts in LF and 6 starts in CF...had 7 multi-hit games, including three 3-hit games...on8/12 at Pit made his Major League debut, started in LF and went 1-for-4 (1 2b, 1bb, 1sb, 1r)...doubled off JeffKarstens for his first career hit...his first 6 hits went for extra-base hits (4 2b, 1 3b, 1hr)...on 8/14 at Pit had 3hits (2 2b, 1 3b) in the second game of his career...became the fourth player in 2008 to produce at least 3 hitsin his first or second Major League game, joining teammate Jay Bruce, Chi's Kosuke Fukudome and NYM'sNick Evans, all of whom did it in their debuts...Dickerson and Bruce are the first pair of Reds teammates toproduce, in the same season, 3 hits in their first or second big league games since Jimmy Outlaw and HarryCraft did it in 1937...on 8/15 vs StL hit his first career HR, a leadoff homer off Brad Thompson...hit anotherleadoff HR on 9/2 vs Pit off Ian Snell...in the ninth inning of the 4-3 win on 9/7 vs the Cubs made his firstcareer pinch-hit appearance and produced a 2-run double off Kerry Wood that tied the game at 3-3...wasscratched from that day's starting lineup because of the left ankle injury...was 1 of 10 Reds players to makehis Major League debut, joining RHP Johnny Cueto, IF Paul Janish, OF Jay Bruce, LHP Daniel Ray Herrera,RHP Daryl Thompson, IF Adam Rosales, RHP Ramon Ramirez, C/IF/OF Wilkin Castillo and RHP JoshRoenicke...in 97g for the Bats hit .287 (11hr, 53rbi, 26sb) and played all 3 outfield positions...from 5/18-5/24was on the Bats' disabled list with a strained left quadriceps muscle...on 7/1 vs Indianapolis produced a grandslam, triple and 5rbi...hit a leadoff HR on 7/12 at Buffalo...from 7/12-7/31 produced a season-best 13-gamehitting streak (.365, 5hr, 9rbi)...that hitting streak ended on 8/1 at Charlotte, when he was ejected in the firstinning for arguing a called strikeout. Combined to hit .263 with 14hr, 55rbi and 30 steals in 30g at Class AA Chattanooga and 104gat Class AAA Louisville...led all Reds minor leaguers in stolen bases...was Louisville's Hitter of the Month forJuly (.299, 2hr, 13rbi)...began the season with the Lookouts and had 5 hits on Opening Day...when promotedto Louisville on 5/7 led Chattanooga in hits (31) and stolen bases (7)...for the Bats on 7/26 at Scranton/Wilkes-Barre became only the fourth batter in franchise history to hit for the cycle (4-6, 5rbi)...on 8/17 at Charlotteproduced a leadoff HR...in the 8-6 victory on 6/8 vs Charlotte hit a 3-run, walkoff HR...following the seasonplayed for the Surprise Rafters in the prestigious Arizona Fall League (25g, .259, 4hr, 15rbi, 5sb). Spent the season at Class AA Chattanooga...ranked fourth in the Southern League in walks(65) and triples (7)...in the 8/16 doubleheader sweep at Montgomery produced 3 homers and 5rbi...from 7/6-8/16 reached base safely in 27 straight games (28-88, .318, 18bb, 7 HR, 19 RBI)...on 8/2 at Huntsville drovein a season-high 4 runs (2-4, HR, 2B)...on 11/20 was added to the 40-man roster. Spent the entire season at Class-A Sarasota, where he batted .236with 11 HR, 43 RBI and 19 stolen bases in 119 games...Was named MVP of the Florida State League All-Star Game as hewent 1-for-3 with 2R, a 2-run homer and a walk. Batted .290 with 4 HR, 39 RBI and 30 stolen bases in 99 gamesbetween Class-A Dayton and Class-A Potomac...Began the season at Dayton, where he batted .303 with 4 HR, 34RBI and 27 stolen bases in 84 games...Was named to the Midwest League's midseason and postseasonAll-Star teams...Was transferred to Potomac on 8/10 and batted .200 with 0 HR, 5RBI and 3 stolen bases in 15 games. Spent his first professional season at Rookie Billings, where hebatted .244 with 6 HR and 38 RBI in 58 games. November 6, 2017 LF Chris Dickerson elected free agency. September 4, 2017 Norfolk Tides activated LF Chris Dickerson from the 7-day disabled list. August 25, 2017 Norfolk Tides placed LF Chris Dickerson on the 7-day disabled list. May 23, 2017 Norfolk Tides activated LF Chris Dickerson from the 7-day disabled list. May 3, 2017 Norfolk Tides placed LF Chris Dickerson on the 7-day disabled list. December 15, 2016 Baltimore Orioles signed free agent LF Chris Dickerson to a minor league contract and invited him to spring training. 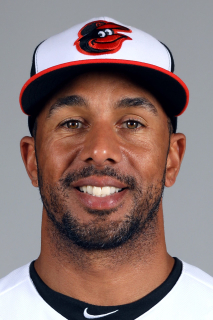 December 15, 2016 LF Chris Dickerson assigned to Norfolk Tides. November 7, 2016 CF Chris Dickerson elected free agency. August 20, 2016 Baltimore Orioles signed free agent OF Chris Dickerson to a minor league contract. August 20, 2016 CF Chris Dickerson assigned to Bowie Baysox. December 27, 2015 OF Chris Dickerson assigned to Toros del Este. November 6, 2015 LF Chris Dickerson elected free agency. September 24, 2015 Buffalo Bisons activated LF Chris Dickerson from the 7-day disabled list. June 11, 2015 Buffalo Bisons placed LF Chris Dickerson on the 7-day disabled list. May 9, 2015 Buffalo Bisons activated LF Chris Dickerson from the 7-day disabled list. April 29, 2015 Buffalo Bisons placed LF Chris Dickerson on the 7-day disabled list. April 28, 2015 Buffalo Bisons activated LF Chris Dickerson from the temporarily inactive list. April 24, 2015 Buffalo Bisons placed LF Chris Dickerson on the temporarily inactive list. February 21, 2015 Toronto Blue Jays signed free agent LF Chris Dickerson to a minor league contract and invited him to spring training. February 21, 2015 LF Chris Dickerson assigned to Buffalo Bisons. September 16, 2014 LF Chris Dickerson elected free agency. September 9, 2014 Cleveland Indians sent LF Chris Dickerson outright to Columbus Clippers. July 7, 2014 Pittsburgh Pirates traded LF Chris Dickerson to Cleveland Indians for Player To Be Named Later. June 6, 2014 Indianapolis Indians activated OF Chris Dickerson from the 7-day disabled list. May 29, 2014 Indianapolis Indians placed OF Chris Dickerson on the 7-day disabled list. April 2, 2014 OF Chris Dickerson assigned to Indianapolis Indians. January 6, 2014 Pittsburgh Pirates signed free agent Chris Dickerson. November 4, 2013 LF Chris Dickerson elected free agency. October 31, 2013 Baltimore Orioles sent LF Chris Dickerson outright to Norfolk Tides. September 6, 2013 Baltimore Orioles selected the contract of Chris Dickerson from Norfolk Tides. July 28, 2013 Baltimore Orioles sent Chris Dickerson outright to Norfolk Tides. July 19, 2013 Baltimore Orioles designated Chris Dickerson for assignment. April 10, 2013 Baltimore Orioles selected the contract of LF Chris Dickerson from Norfolk Tides. April 2, 2013 Chris Dickerson assigned to Norfolk Tides. January 29, 2013 Baltimore Orioles signed free agent LF Chris Dickerson to a minor league contract and invited him to spring training. January 11, 2013 New York Yankees released LF Chris Dickerson. January 4, 2013 New York Yankees designated LF Chris Dickerson for assignment. October 19, 2012 New York Yankees activated LF Chris Dickerson. September 1, 2012 New York Yankees selected the contract of LF Chris Dickerson from Scranton/Wilkes-Barre Yankees. June 6, 2012 Chris Dickerson roster status changed by Scranton/Wilkes-Barre Yankees. April 14, 2012 Scranton/Wilkes-Barre Yankees placed LF Chris Dickerson on the 7-day disabled list retroactive to April 12, 2012. February 26, 2012 New York Yankees sent LF Chris Dickerson outright to Scranton/Wilkes-Barre Yankees. September 1, 2011 New York Yankees recalled Chris Dickerson from Scranton/Wilkes-Barre Yankees. August 4, 2011 Chris Dickerson roster status changed by Scranton/Wilkes-Barre Yankees. July 31, 2011 Scranton/Wilkes-Barre Yankees placed LF Chris Dickerson on the temporarily inactive list. July 30, 2011 New York Yankees optioned LF Chris Dickerson to Scranton/Wilkes-Barre Yankees. July 17, 2011 New York Yankees recalled Chris Dickerson from Scranton/Wilkes-Barre Yankees. July 17, 2011 Chris Dickerson roster status changed by New York Yankees. July 4, 2011 New York Yankees optioned Chris Dickerson to Scranton/Wilkes-Barre Yankees. June 12, 2011 New York Yankees recalled Chris Dickerson from Scranton/Wilkes-Barre Yankees. June 10, 2011 New York Yankees optioned Chris Dickerson to Scranton/Wilkes-Barre Yankees. May 17, 2011 New York Yankees selected the contract of Chris Dickerson from Scranton/Wilkes-Barre Yankees. March 30, 2011 New York Yankees optioned Chris Dickerson to Scranton/Wilkes-Barre Yankees. August 9, 2010 Milwaukee Brewers traded CF Jim Edmonds to Cincinnati Reds for LF Chris Dickerson. July 16, 2010 sent LF Chris Dickerson on a rehab assignment to Louisville Bats. May 29, 2010 Chris Dickerson roster status changed by Cincinnati Reds. April 30, 2010 Cincinnati Reds placed LF Chris Dickerson on the 15-day disabled list. Sprained right wrist. September 30, 2009 Cincinnati Reds activated LF Chris Dickerson from the 15-day disabled list. August 24, 2009 Cincinnati Reds placed LF Chris Dickerson on the 15-day disabled list. Severely sprained his left ankle. August 11, 2009 Cincinnati Reds activated LF Chris Dickerson from the 15-day disabled list. August 6, 2009 sent LF Chris Dickerson on a rehab assignment to Louisville Bats. July 27, 2009 Cincinnati Reds placed LF Chris Dickerson on the 15-day disabled list. Bruised right rotator cuff.